Flexible work space can be a huge benefit to a business in terms of time, cost, and overall functionality. 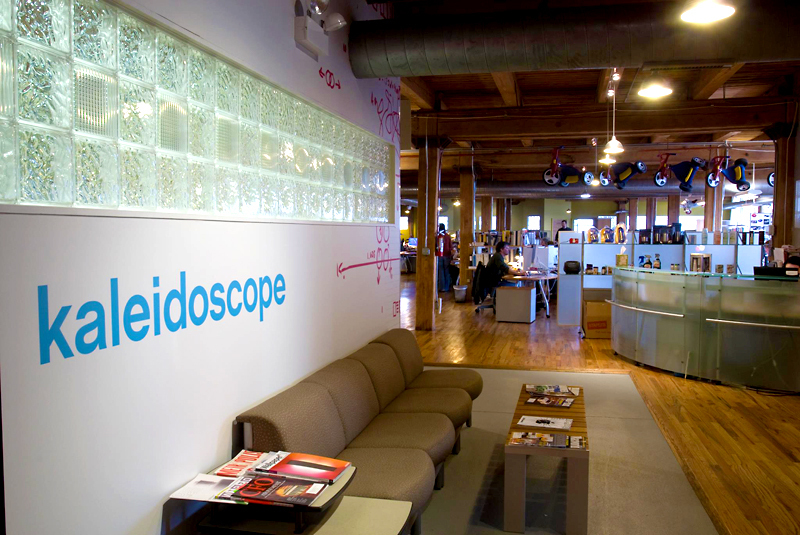 To get a great perspective on how this can be achieved, just ask the fine people at Kaleidoscope, who utilize everything from classic loft office space to innovation labs and even a private roof deck to make the ideal work environment at the Universal Building near West Town in Chicago. Kaleidoscope, the world’s premier integrated brand design and realization agency moved in to 700 Sacramento in 2001 and has the prestige of being the building’s first official tenant. With its 27,000-square-foot office loft floor plan, the firm has been able to establish distinct spaces for its multiple areas of expertise. From design and development, to sales and account management, the Universal Building allows Kaleidoscope to be a one-stop shop. Kaleidoscope is used to working with high-profile clients on a national and international scale. The firm specializes in brand identity, packaging and industrial design and has worked with such major firms as Wrigley, Radio Flyer, Calphalon, and Carmex. From the Chicago headquarters it is able to provide brand strategy and consumer insights, brand identity and packaging design, structural packaging and product design from the conceptual phase to the actual implementation. Walking through the firm’s offices near West Town, one quickly realizes that there is a lot going on. The office’s configuration allows the firm’s 50 local employees to spread out and focus on their area of expertise. The firm has a traditional loft office space for its designers and administration, an innovation lab that inspires innovative approaches to tackling complex packaging questions, a separate loft office section for its sales team, a large conference room for client meetings, and an ideation space complete with magnetic walls and white boards where team members can collaborate. The workspace layout has worked well thus far, but recently Kaleidoscope has decided to shake things up a bit and is developing plans to reconfigure its office workspace. Creativity is a premium for the firm and fostering an open, collaborative environment helps designers achieve this. Fortunately, the floor plan at the Universal Building will allow the firm to develop the exact space that it desires by combining work stations and creating new meeting areas. Beyond the workspace, Kaleidoscope takes advantage of some nice amenity perks as the firm has a personal roof deck with a skyline view and a complete kitchen and dining area the firm has designed to resemble a 1950s diner. To learn more about office loft space to lease near West Town, contact us here or call 773-638-5450.